. . . CLICK here for shinsatsu Photos ! 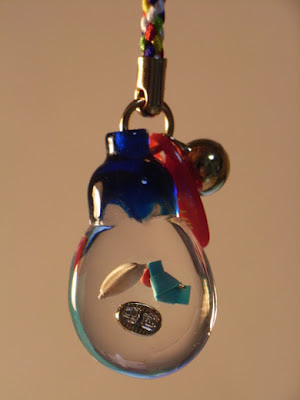 Shinsatsu are a type of thaumaturgic talisman (also known as gofu 護符 ) distributed at shrines and considered symbols of a spiritual being or its supranormal power. 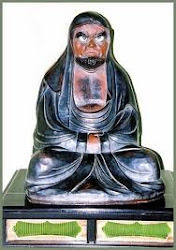 Shinsatsu may be made of wood, paper, or metal, and bear a written or printed inscription; the term is generally used to refer to the relatively large kind of amulets enshrined in kamidana, or affixed over gates, on doors and pillars, or on ceilings. Most are meant as general invocations against illness and accident, for safety within the home, national peace, and success in business, but others have more specific aims, such as protection from fire, theft, snow, or insects. Jingū (Ise) taima たいま(大麻) and these also represent one kind of shinsatsu. likewise represent a type of gofu amulet, but the term usually refers to a talisman distributed in a small bag made of brocade or ornate cloth and meant to be carried on the person. Like shinsatsu, mamorifuda may be made of wood or metal. Their origins lie in the talismans made by priests of Onmyōdō (Chinese Yin-Yang divination) or at Buddhist temples, and which later came to be produced at shrines as well. Mamorifuda can be found in a wide variety of types, the major kinds representing charms against illness and misfortune, invocations of household safety, safe childbirth, relief from snow or insects, traffic safety, safety at sea, and protection from bad fortune. Many are made to be worn on the body as personal invocations of divine aid. source : Okada Yoshiyuki - Kokugakuin University.
. kekkai fuda 結界札（5枚1組） "talisman for the sacred boundary".
. Temple Yugyoo-Ji 遊行寺 Yugyo-Ji . floating of temple amulets .
. eggplant, nasu 茄子 (なす), nasubi なすび .
. Omamori, O-Mamori 御守 Amulets and Talismans .